Unity History – Unity Shoppe Inc.
During the early 1900s, families purchased summer homes in Santa Barbara and needed part time workers. We are proud to celebrate Unity’s first 100 years of Community Service. Dr. Pearl Chase noticed that many of these workers had problems with the expense of living in Santa Barbara. She started working with community volunteers to help them during the Christmas season. They organized three committees to assist low -income children, families, and the elderly. This remarkable project became known as the Council of Christmas Cheer in the 30s. The young and old, rich and poor and people from all races, creeds and color worked together for 100 years, so “Neighbors could help their low-income Neighbors.” For the first 69 years no one was paid and less than $10,000 annually was donated to help thousands of people. Kenny Loggins renamed the work (Unity Shoppe) in 1988 because it was now a year-round operation. Today, nearly 20,000 unduplicated people are referred by 300 non-profits, churches, schools and hospitals so more people can be helped with better and more consistent support services. In 1916, community volunteers began to help low-income children and seniors during the holiday. Children in the hospital woke up on Christmas morning to find a stocking from “Santa” on their bed post. The Holiday Volunteers also provided low-income Seniors with special entertainment and refreshments so they would have a place to go on Christmas day. In 1917, Dr. Pearl Chase met with holiday volunteers at the Neighborhood House to help them organize their efforts with three key committees so duplication could be avoided and more seniors, children and families could be helped. In the early thirties, all the committees were consolidated into a single unified organization called “The Council of Christmas Cheer.” They agreed to follow the “Rules and Principles of Giving” adopted from the Council of Social Agencies. This began a policy of giving parents the opportunity to shop for their needs so they could take care of their own families. County Hospital and the Hillside House were added to the list of 23 agencies sending clients for services. It was necessary to move to the Catholic Welfare Agency so 2,683 people could be helped. The city population in 1957 was 55,755. Dr. Chase approached SB Foundation to help the Council purchase a building for its work. Since the Catholic Agency was also asking for help to build a large storage space on their property, it was agreed that the Council could use 930 sq. ft. of that building donated by SB Foundation so both agencies would have a place for their work. The Council agreed to help the nuns with services for all their low-income families. In 1974, Dr. Chase asked to be relieved of her responsibilities. She gave her manuscripts and photos to UCSB. The Council of Christmas Cheer retained their historical documents, kept since the 30s. 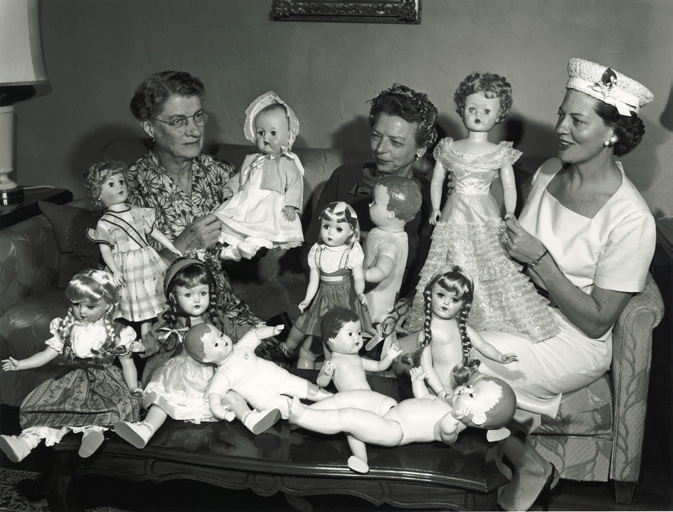 In 1973, Barbara Tellefson found a group of seniors washing dirty broken toys in a Haley Street parking lot. She had been studying how the community was helping low-income families and volunteered because their approach was so kind and helpful. Barbara had raised a boy by herself and understood how difficult it was for women raising children alone. The work of the Council touched her deeply and she was inspired by the respect the retired volunteers had for the people they served. She saw enormous potential to keep people in the workplace and away from welfare services while supporting the family unit so parents could retain the respect of their children. The families were treated with dignity and there was a great deal of effort to give what was needed. Dr. Chase died (November 1888 – October 1979), having lived a long and fruitful life, devoting her time to the betterment of her community. She left $67,800 to 23 charities. The elderly volunteers wanted to close the agency and retire. Barbara volunteered to continue the work and became a 20-year volunteer, Director and President of a 19 member Board. Receiving help were 658 families and 1,708 children with a budget of only $10,575. Catholic Welfare needed more space and Sid Smith suggest that 3 portable school rooms could be used if they were brought up to code. The Council made an agreement to stay on the property by purchasing one of the buildings and raising the $30,000 to bring the buildings up to code. Both agencies had more room and the work continued. 1500 families referred by 100 agencies – – The public collected donated food for 8 small pantries which distributed groceries once a month. When mothers could not find the food they needed, they went from place to place looking for more. They became very frustrated! When there wasn’t enough food, they used their rent money and some became dependent on welfare. The Council realized that parents cannot work and children cannot learn when families do not have the right food in their households. 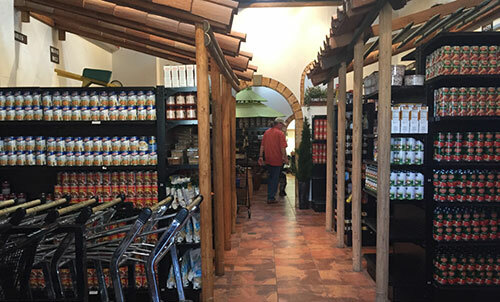 Prepackaged and food bags were eliminated when Unity opened the first “Free Grocery Store” to allow families to shop. Unity asked what was wanted and purchased the food products requested. Low-income parents could now feed their own children, and families became more united when they ate together and bonded with their children. Unity encouraged agencies to work to eliminate duplication, so more people could receive better and more consistent sup- port. In order to obtain more donated food, Unity volunteers opened the Food Bank which was to be a good resource for all agencies that distributed food or ran feeding programs as a part of their mission. Unity could not collect enough toys to help all the children (4,000) referred during the holiday season. Kenny Loggins, spokesman for The Marine Corps Toys for Tots program, agreed to help Unity secure some of the toys collected in Santa Barbara for the children that were being referred by 100 other non-profits throughout Santa Barbara County. After reviewing Unity policies and work, the Toys for Tots program agreed to support Unity’s efforts to distribute toys collected in Santa Barbara. Kenny Loggins studied Unity programs and felt that giving parents the opportunity to shop with their children was very important in strengthening family bonds. He suggested that the agency needed “to raise funds and keep good records,” and he donated his computer! Weeks later, Unity heard that he decided to do a concert to help with Unity’s first fund-raiser. He also arranged with KEYT3 and the Smith Family to do a “Christmas Unity Telethon.” This amazing news softened the bad news that the catholic Charities’ space would no longer be available for Unity. Barbara Tellefson found the old Baptist Church on Victoria Street and decided that would be an ideal location for several charities and an opportunity to collaborate with others. Barbara talked with Mrs. Johnson who generously reduced her asking price for the church. With the support of Kenny Loggins, Larry Crandell, Bob Scott, and Richard Berti they gathered committee to support the purchase. RSVP agreed to join in a partnership with Unity. CALM was asked to join, because their building search and escrow had not worked out, so they agreed to be involved. A kind & gentle breeze lifted Unity’s hopes so their mission could be carried into the future! The agency name was changed to the “Unity Shoppe” because operations were year-round not just during the Holidays. The Painted Cave Fire destroyed over 500 homes and businesses on June 27, 1990 and left many people with nothing but the clothes on their backs. For years, Unity had been working to improve its “Central Distribution Facility,” which included a Grocery & Clothing store, Job Clothing &Training programs, Long-term Disaster program and a Senior Resource Center. Unity was open daily and helping all those being referred by other agencies during times of crisis. Already equipped and ready to help anyone referred, it seemed natural that Unity would make services available to those that lost their homes. 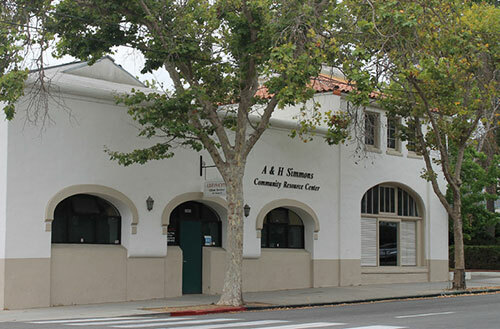 The City Building at 1235 Chapala St was leased by Unity to accommodate the distribution of free clothing and senior needs. It was located just across from the new Victoria Street Community House (VSCH). In 1999, Unity was asked to vacate this property. A new search for space close to VSCH began so Unity could relocate Senior Services. Unity needed a site close to VSCH, so current employees and volunteers could operate both buildings. Bob Smith, owner of Smith Broadcasting, volunteered to help Unity acquire a new building, so its many services would not be affected by the loss of the city lease. Mr. Smith became Unity’s Chairman of the Board, and many of his friends agreed to support the State St purchase for Unity. Mr. Smith was ill and never saw the State Street building located only 50 yards away from VSCH and the upgrades made in order to serve 13,000 households. 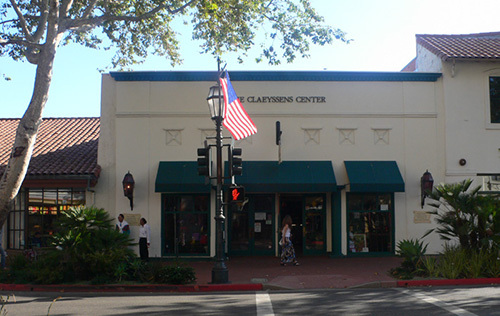 Pierre Claeyssens gave Unity a $1 million matching grant to secure the new State Street site. He said he understood what it was like to need food because of the food shortages in Europe during the war. He had toured Unity’s operation and felt that the ability to choose a family’s food was very important for mothers. He wanted to help Unity secure a place for a grocery store for low-income families and the elderly. Tom Reed joined Unity as a volunteer to help secure matching funds so the new building could be purchased. The Unity Telethon continued to raise $1 million annually in the VSCH church hall. 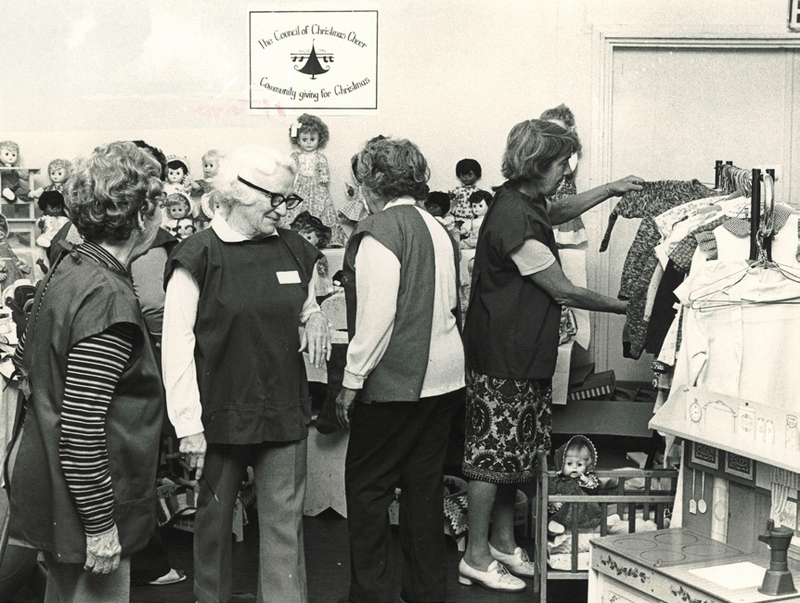 Those funds made it possible to purchase food, clothing, children’s & senior needs. The staff remained small, and Unity was blessed with the support of thousands of volunteers, the young and old, the rich and poor and people from all races, creeds and colors. Unity was recognized with the President’s “Point of Light Award” in Washington D.C in 1998. By this time, Unity was providing services to 12,569 unduplicated people annually. In 2004, Tom Reed was elected by the Unity Board of Directors as the new Executive Director. The Unity Shoppe was serving the clients of 300 other agencies, churches, schools and hospitals throughout the coun- ty. Full services made it possible for people to get the help needed to avoid welfare and homeless situations. Referred, qualified and documented clients continued to work and take care of their own children. Unity’s co-owners decided to sell the Church Hall in the VSCH. Unity had purchased the building to use for its charitable purposes and asked for adherence to the legal documents which gave co-owners the right to purchase. When this was not honored, Unity lost its ability to raise its own future funding and the right to use VSCH. With a loss of $2.5 million, there was not enough money to purchase another site.